Will You Be At the 2011 Gluten and Allergen Free Expo? What are you doing this weekend? Do you have any big plans? Do you want some? Will you be anywhere near Chicago (“near” meaning even a quick plane ride away)? Well. I know how I can help you plan your weekend. And I presume, that if you are reading my blog, you may just have a slight interest in what this event is all about. The place to be this weekend is the 2011 Gluten and Allergen Free Expo. If you had not guessed yet, I will be there and cannot wait for it. And apparently, it seems like the place to be if you have anything to do with a Gluten Free or Allergy Free lifestyle. It is an amazing who’s-who of the Gluten Free and Allergy Free world. The Gluten and Allergen Free Expo, was founded in 2008 by Jen Cafferty of Gluten Free Life with Jen. She wanted to introduce Chicago area attendees to some of the leading culinary and health experts in the gluten-free arena. In the last three years, the Expo has grown to reach over 700 attendees throughout the United States and Canada and the title sponsor is now Living Without Magazine. 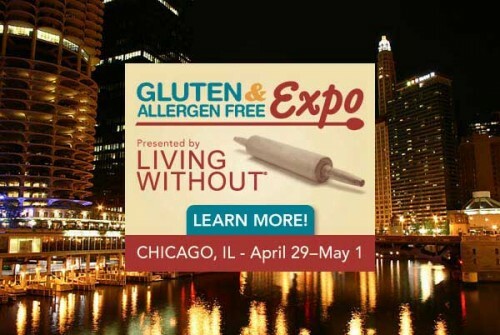 Why did Living Without get involved in the Gluten and Allergen Free Expo this year? We want to support the Expo for a number of reasons. Overall, it’s a great educational and cooking event for the gluten-free and food-allergic communities. It offers two tracks, one for newbies and the other for more seasoned cooks so there’s a workshop for everyone. The vendor event brings in allergy-friendly manufacturers from around the country. I guess most important is that the Expo gives people with food allergies and sensitivities the chance to get together to share stories, exchange advice, learn new things and meet-and-greet. The networking opportunities are wonderful. The Expo reinforces the fact that this community is vibrant and vital, that there is a lot of delicious food out there, and that those of us on a special diet don’t have to feel isolated or alone. In fact, living without can be a lot of fun—and taste great, too. What kinds of cooking demonstrations will you be presenting at the Expo? Many of my favorite chefs and bakers (regular contributors to the magazine) are also presenting–Mary Capone, Anna Sobaski and Sueson Vess. Carol Fenster was the magazine’s original food editor way back when. Do you have suggestions for tasty, healthy substitutions for the most typical allergens, like dairy and eggs? Yes. We include a page called Substitution Solutions in every issue of the magazine. The best replacement ingredient depends on the recipe, of course. Let’s look at dairy. Personally, I’ve been using a lot of coconut milk and coconut butter lately as dairy replacements. I like the way they work. But there are nice milk substitutions out there—rice, soy, almond (if you tolerate nuts), hemp. There’s a milk powder made from potatoes. Several months ago at Natural Products Expo West, I even saw milk made from sunflower seeds but this product isn’t on the market yet. Eggs can be more challenging to replace, especially in baked goods. Luckily, Ener-G Foods sells a gluten-free egg replacer that works great in many recipes. Other times, you can use flax gel (1 tablespoon flaxmeal combined with 3 tablespoons warm water equals 1 egg), pureed silken tofu and even applesauce, depending on the recipe. Again, we explain how to use these substitutions and others in Living Without magazine. What about ideas/substitutions for people on a gluten-free diet? In addition to many new products (pastas, prepared baked items, soups, soy sauce, etc. ), there are now wonderful gluten-free flours available with high protein and fiber content, as well as notable levels of nutrients. Sorghum, amaranth, brown rice, teff, millet, quinoa, almond, coconut flours are just a few examples. The right mixture in the correct ratios (flour to starch) yields excellent results. The great thing about today’s market is there are more and more gluten-free products available in mainstream grocery stores. And many of these products actually taste great. In my option, there’s never been a better time to be gluten free. What do you find are the most common misperceptions about food allergies? I think the issue of what constitutes a food allergy and allergic reaction is confusing to many in the general public. The reason is that allergic reactions lie along a spectrum. Someone can react mildly to a food allergen with, for example, a slight tingling in the mouth or perhaps a skin rash. Someone else will react to that same allergen with full-blown anaphylaxis where they must be hospitalized to get symptoms under control. This type of reaction is life-threatening. Yet these are all considered a “food allergy” and an “allergic reaction.” Outside of the medical community, there aren’t different words used for varying levels of allergic severity, so people with life-threatening food allergies may not be taken seriously. This is a big challenge. When it comes to celiac disease, I think that new research that distinguishes celiac disease from gluten sensitivity will reveal that a lot of people should, in fact, be gluten free even though test results don’t show them to be within the strict parameters of a celiac diagnosis. You can be very sensitive to gluten and yet not be diagnosed with celiac disease. What advice do you want to convey to people with food allergies and sensitivities? That you’re not alone and that there’s hope. That you can have a full, vibrant, healthy life with food allergies and sensitivities. That you can live well while living without. How can people learn more about food allergies and Living Without? Go to our website at LivingWithout.com. So..I hope to see you there. If you are going, make sure to stop by my Vendor Table. I would absolutely love to meet you. I will be there sharing my Cook It Allergy Free iPhone and iPad Apps at the event. Let me know, below, if you plan on going and I will keep my eye out for you. I’ll be there! Look forward to meeting you, Kim! Yay! Heather, I am totally looking forward to meeting you, too! 😉 See you this weekend! Found you on twitter and am now looking to review your app! I hope I get to meet you on Saturday! Woop! Woop! Cannot wait to give my favorite Dairy-Free Gal a great big hug!! Almost here … can’t believe it! So ready to see everyone. Not sure about all the rest … you know? The getting ready before I leave part, making sure I get everything in my presentation, etc. 😉 It all works out though, right? Okay, Shirley! I am sending the most productive vibes I can muster up across the country right now so that overnight, everything magically gets done and you can walk onto that plane Thursday morning feeling cool as a cucumber and totally prepared! WOO-HOO, this is going to be an awesome (albeit, down right COLD) weekend!! Cold is right, my Southwestern pal. I am going to be a total wimp considering it has been in the high 80’s here for the last few weeks!! That is too funny, Maggie! We say the same thing in our house. My kids are so excited that Grandma is coming to stay with them that they cannot wait to boot us out. Conner said to me tonight, “Only 3 more sleeps until you can leave and we can have fun with Grandma!” Geez. It is too bad that they are so sad we are leaving! @Heidi. Just be glad it’s warmed up. Last week we had high temps in the 40’s. We even had some snow showers the weekend before last. This weekend it should be at or slightly above normal for this time of year (low to mid 60’s for the daily high and mid 40’s to mid 50’s for the lows). And make sure to bring your umbrellas! Well, we DID have highs in the 80s here for a time. It was heavenly. But that was a few weeks ago and short lived. Janet, you need to make a trip to sunny AZ. You would probably start begging for the cold again by summertime! LOL! Oh, been there, done that. I remember vacationing at Lake Havasu and spending the whole time immersed in water to keep from melting from the heat. Even the dog was addicted to spending all her time laying in the shallows to keep cool. I will be there! Can’t hardly wait!!!! Although just read the comments about cold – eeks! That’s ok, I can deal! Carol, I cannot wait either! We can be wimps about the weather together, since you are used to the same heat I am… 😉 See you in 2 days!! Yippee! I wish I could attend…i am gluten free AND allergic to CORN and a newbie. I wish there was better listing for corn allergy…like some citric acid derived from corn…will look forward to new articles! I wish we could make it. My 13 year old daughter has celiac and DH. We live in Michigan but her dad lives in Downers Grove,Ill. So we are hoping he goes and gets lots of info for us!